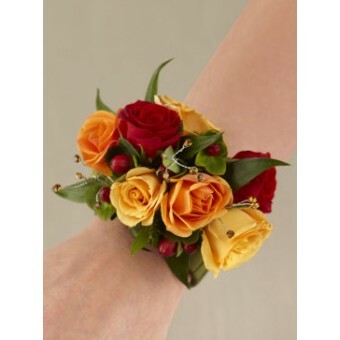 We’ve designed this lavish wrist corsage with fresh roses in harmonious shades of red, orange and yellow. The result is an irresistible adornment of radiant colour that is also rich in detail. The natural beauty of these classic roses will enhance any dress perfectly. Featuring a red hypericum and spray roses in red, orange and yellow with ruscus set onto a white wrap wristlet trimmed with rhinestones.